Our AutoDesk Revit Architecture 2011 Tutorials consists of over 29 hours of instructor-led training, covering over 420 specific topics. This detailed DVD tutorial teaches you to effectively utilize the newest features, functions and user interface of Revit Architecture 2011. Our Revit Architecture training dvd will provide you with the skills necessary for building information modeling (BIM) in AutoDesk Revit Architecture. 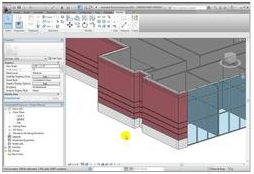 The video based tutorials cover the features and functions used to develop, analyze and document building designs. Lessons include concepts and demonstrations to familiarize you with the new ribbon and icons, as we guide you through modeling, drafting and detailing, components and families. In addition, the Revit Architecture training covers collaboration, design analysis, annotation, printing and publishing, family creation, and much more. In addition, lesson files are included with this training dvd, so you may practice with the actual project files on your own computer and software, as you proceed through our Revit Architecture 2011 training dvd. Sean Burke is a Digital Design Technology Specialist with extensive experience in the architecture profession. He is considered a leading expert in Building Information Modeling (BIM) processes and tools for the design and construction industry, including Autodesk Revit and AutoCAD Architecture (formerly known as Architectural Desktop).